Snowy treetops glistening while shimmering icicles ornament each rain gutter. As you walk, the frosty air nipping at your cheeks–its crispness, with each breath, as refreshing as peppermint on your tongue. Is winter the season you anticipate most and, this Christmas, you are dreaming of an ice storm? If so, be as radiant as Shin Se-Kyung and let your inner Snow Goddess dazzle them this holiday. In her photoshoot for December’s issue of Céci magazine, Shin wears a cape inspired knit sweater dress. Along with chiffon and lace dresses, the sweater dress is also very popular this winter season in South Korea. As a casual way of dressing up while still staying warm, it’s both stylish and comfortable, and great for a casual holiday gathering with friends or a family dinner party. Look for one with delicate detail like Tokyo Fashion’s Knit Dress ($48). With its crocheted cape collar and vertical knit design, this sweater is both feminine and sweet. Instead of solid colored leggings, look for printed tights with a cute detail like Shy Shy’s printed tights ($22). With its ornate wallpaper design, these tights allude to the Rococo era while adding a touch of femininity and youthfulness. Another design to consider is floral print ($20). With its dotted pattern and floral border running down the side of the leg, theses tights are sweetly coquettish in a girlish way. Printed tights have a cute yet alluring appeal, so choose one that balances between both and fits your personal style. Also, popular in Korea is the walker boot. 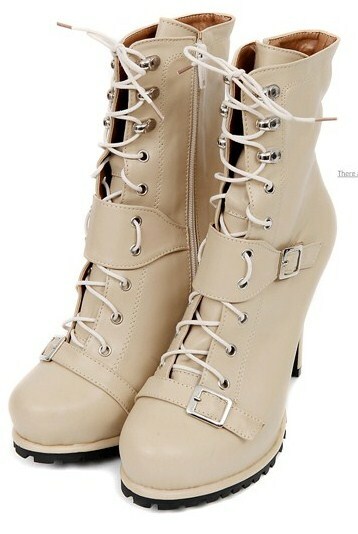 Look for a pair like Redopin’s lace up boots ($76.50) which would compliment a knit sweater. With its working-boot sole, high heel and buckle detail, this female rendition of a man’s boot is both comfortable and feminine with great sole traction banishing any worries of slipping. A wedged heel will also provide stability. Smoothie’s faux-fur lined wedge tall boots ($50) are both comfortable to walk in as well as super warm. These boots are versatile and can be worn in many different fashions: with the boot shaft folded down revealing the fur lining; rolled up to the knee revealing the outer material; folded into cuffs. You can also keep warm with a sweet fluffy hat like Missthea’s fleecing beret ($35) with its sequin-lined bow detail. Made of 50% Angora Wool, it has a silky texture as well as very warm and light. If your hesitant about wearing fur garments, no worries. Angora bunnies are sheared and/or their molted fur is either plucked or collected. In her shoot, Shin wears many different pieces of jewelry at once. 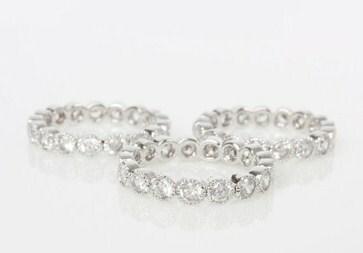 She wears many rings–even doubling them on certain fingers. If you choose to follow in her lead, look for one with many stones like Briolette’s rhinestone ring ($48) which can be worn individually or stacked. 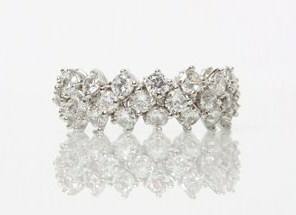 Another option, is a ring with its multiple stone pattern like Briolette’s rhinestones ring ($50). Shin also wears beautiful, delicate neck jewelry. Since the neck and collarbone are exposed when wearing a collared knit dress, a necklace will fall nicely without out catching to the fabric. Choose one with elaborate yet visually pleasing detail like 6thJune’s “Scope” Guarding Angel necklace ($35). Although its design seems very simple, a rounded cut Cubic Zirconia hides within the hallow heart and star sphere. 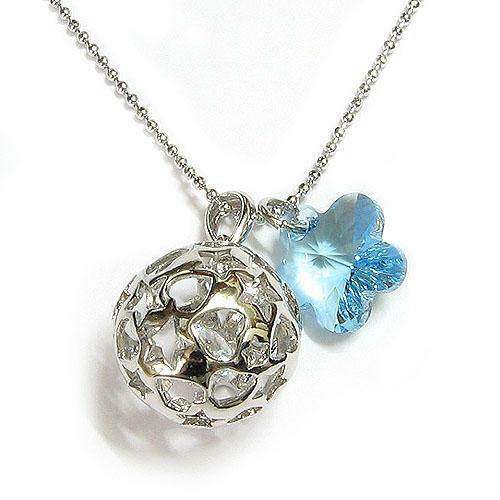 A blue Swarovski crystal flower, resembling the snow flowers filmed in the shoot, accompanies the main pendant giving the necklace a touch of color and sparkle. This year, why not opt for a cozy knit sweater dress? You’ll radiate sweet femininity and a fun coquettish nature like a Céci Snow Goddess. Hope you’ve enjoyed our final installment. Happy Holidays!